Due to a lack of adequate research carried out in Australia to derive ARF for use in the different parts of the country, “Australian Rainfall and Runoff” (ARR87, IEAust, 1987) recommended the set of curves derived from a study in the Chicago area for all Australian zones except for the dry inland area of Zone 5 (Figures 2.6 and 3.2 in ARR87). These ARF values apply to design rainfalls for any average recurrence interval (ARI) up to 100 years. The ARFs obtained from a study in the Arizona area, a semi-arid part in the United States, were recommended for use in Zone 5 (Figure 2.7 in ARR87). There has since been a concern in some sections of the Australian hydrological community that the results from the United States may not be appropriate for the Australian conditions. This concern was confirmed by a number of studies (Nittim, 1989; Avery, 1991; Porter and Ladson, 1993; Masters, 1993; Masters and Irish, 1994; Meynink and Brady, 1993) in which the authors found that the values from ARR87 were generally larger than those from their own study. Moreover, studies in the United Kingdom (Bell, 1976; Stewart, 1989) have conclusively shown that ARFs for that region are dependent on the annual exceedance probability (AEP) of the rainfall. 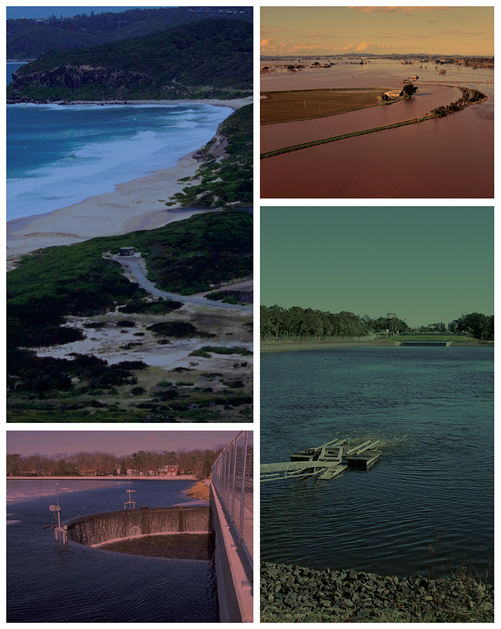 The above established the development of ARFs appropriate to Australia as a high priority research area in flood estimation. This report provides a summary of ARF assessments around Australia that are recommended for current use in design practice. It also provides a list of recommendations for future research work to further reduce any potential uncertainty in design flood estimates introduced due to uncertainties in the ARF. The report can be downloaded here. Mark Babister, the editor of Project 15, will be giving a presentation on the 23rd of May in the Engineers Australia office in Darwin. This seminar will provide details on the Australian Rainfall & Runoff Update. The session will include Project 5 software demonstration and a presentation on Project 15 – Hydraulic Modelling. Flyer can be downloaded here. Andrew McCowan and Mark Babister are running a half day workshop on the recently completed ARR project 15 two dimensional Modelling on Monday the 13th of May. This will be followed by an update on the ARR revision progress. The presentation will also cover the test catchments program which is aimed at testing and validating new methods. Sample catchments in each state/territory will be used and tested with these new methods. Workshop flyer can be downloaded here and the presentation flyer here. ARR editor Professor James Ball will be giving a presentation on the status of the ARR update at the Engineers Australia Regional Convention in Port Macquarie. Presented will be advice on the document, the progress towards completion and the many changes to practice that will arise from its publication. The convention runs from the 24th to the 26th of May. Flyer can be downloaded here. Those interested in officially reviewing projects should email [email protected] briefly describing which projects they are interested in reviewing and what qualifications/experience they have in those practice areas. Please include a brief CV. Those wishing to review project reports in an unofficial capacity can download project reports from the website and email comments to [email protected].